From the rich architectural heritage of Madrid to the tropical paradise of the Canary Islands, each region in Spain has its own unique flavor. Whether you want to spend your babymoon viewing masterpieces of art, lying on white sand beaches or just soaking up the atmosphere in this diverse country, Spain has much to offer babymooning couples seeking that "last hurrah" vacation. The Gran Hotel Bahia del Duque Resort is located in south Tenerife, an island surrounded by the beautiful sapphire blue of the Atlantic and famous for its perfect year-round climate. Tenerife offers stunning beaches, thick forests and truly breathtaking, soaring cliffs. The hotel itself is a luxurious complex reflecting colonial influences. Recently refurbished, it features beautiful architecture, gorgeous rooms and exquisite cuisine at its 9 restaurants. Hospes Palau De La Mar is a refurbished palace located in the heart of Valencia. Offering you easy access to the attractions of this historic city, the hotel is 'made for romance', from its stunning architecture to its fairy tale marble staircase. Rooms are elegant, modern and luxurious and the food is divine, with the Gourmet Senzone Restaurant offering a sampling menu of Mediterranean and Valencian flavors. 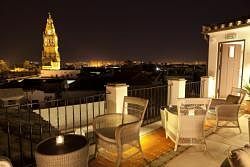 Selected by Conde Nast Traveler magazine as one of the best 6 hotels in the world and one of the best 121 new hotels in the world, the Balcón de Córdoba combines the romance of a stay in an ancient town with all the comfort and convenience of modern, contemporary accommodation. The atmosphere is intimate, with just 10 rooms distributed over two floors. Perhaps the most romantic aspect of this hotel are the elegant courtyards and balconies, which offer a relaxed, secluded setting in which to soak up the beauty of this historic destination. Rooms are simply yet stylishly furnished, with predominantly white, beige and grey linen and upholstery and high quality finishes in the bathrooms, such as golden sandstone and sierra Elvira stone. Equally important on a pre-baby getaway is attention to all the little details - and the Balcón de Córdoba provides an excellent 'at home' service that ensures you are as comfortable as possible, from allowing you to select the pillow most perfectly suited to you, to providing room service tapas at any time, day or night (ideal for indulging those late night cravings!). 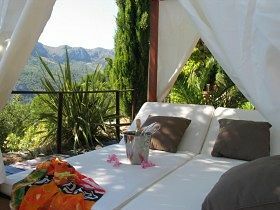 Looking for somewhere a little more secluded for your Spanish babymoon... somewhere off the beaten path? 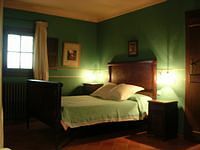 Then take a look at the charming Casa Abadia, a fully restored 17th century abbey in the little mountain village of Samitier in the Pyrenees. Unwind and recharge your batteries in this peaceful, out-of-the-way location that offers magnificent views of the dramatic landscape. This intimate bed and breakfast has only 8 rooms, with a lovely garden in which to relax. In addition to breakfast, dinner - prepared with fresh local products and herbs - is available every evening. There is no traditional babymoon package at Casa Abadia - however, the rooms are gorgeously romantic... quaint, cozy and comfortable - making it the perfect place to create some special memories before two becomes three! DDG retreat is a babymooners paradise... a private, luxurious, intimate hotel with only 5 casas and a luxurious villa. You are guaranteed perfect peace and quiet, with the owners intent on ensuring you de-stress and are not disturbed during your stay, even in shared areas. Set in the heart of the Andalusian countryside, DDG Retreat is also close to the popular attractions of Andalusia and beaches of the Costa del Sol should you wish to take in the sights. But if relaxation is your goal, the hotel is simply perfect for "getting away from it all", with romantic cottages designed for two and equipped with self-catering facilities. Each has its own unique features, designed to make your stay simply unforgettable. There are a variety of romance packages available at the hotel which would be ideal for your final holiday before your new addition arrives, from a luxurious spa break to a weekend romantic getaway. Can Curreu is a rural hotel and spa situated in San Carlos, a part of Ibiza that has retained its cultural identity. The hotel prides itself on providing a high quality service in harmonious, natural surroundings, and its restaurant offers a delectable menu, comprising traditional cuisine with a contemporary touch. The individually decorated rooms are chic, cool and comfortable and the hotel offers you the perfect base from which to explore the stunning island of Ibiza, or in which to simply relax and unwind. The hotel's "Romantic Getaway" package would make a wonderful babymoon break and includes..